Do you have Battle Ready Full Tang Functional High Carbon Steel Authentic Samurai Swords? What type of katana should I get? I don't do martial arts - why should I look at Shinken? Why don't you sell real swords from Japan? How important is folding a blade? How many mekugi pins should a katana have? Why should I buy a sword from Nihonzashi? Well you might have come to the right place for all the wrong reasons. There is a ton of hype and sales pitches surrounding katana. Are you looking for a good katana or a good sales pitch? At Nihonzashi we sell swords for serious martial artists and those who are serious about swords because that is who we are. If we think it is a decorative sword - we tell you. There is nothing wrong with a decorative sword but you should know that what you are buying. Battle Ready - Just what does this mean? Are you expecting the fall of civilization and want to have something ready for the chaos? Are you expecting zombies to attack and you need something to defend the house? This label really lacks any meaning. That "Battle Ready Katana" may be the last thing you should grab if the hordes of undead do show up. Full Tang - This is preferred over what is commonly called a "rat tail" tang, but it does not make the katana usable. The term Full Tang has become another label to make the consumer think they are getting something good. Functional / Practical - We do sell the "Practical Katana" but that is the model name. Most katana with the functional and practical label are just glorified wall hangers. There is no definition of either functional or practical that the katana has to meet. High Carbon Steel - Most people don't realize that most stainless steel is too brittle for swords, so High Carbon Steel has become a sales pitch. High Carbon Steel is soft if not tempered and can become brittle if hardened too much. It can be used to make good katana, but is also used to make wall hangers that rust. Authentic Samurai Sword - We have never seen anything labeled as an authentic samurai sword that was actually owned by a samurai. There are still allot of katana that were around before 1867 when the samurai class was abolished, but they bear little resemblance to most katana being sold with this label. Most people think of them as Samurai Swords and not katana or wakizashi. Authentic - well we do sell real swords if that is what you mean. First you should ask yourself what you want the sword for. If you want something cool to hang on the wall - just about anything will do. If you think you might want to learn Japanese swordsmanship and want something useful - then you want an iaito or shinken katana that can stand up to the rigors of real training. Iaito are used for practicing basic cuts and kata (forms). They are not made for banging together or cutting anything. Shinken are real katana made for tameshigiri or cutting practice. A katana should stand up to abuse, keep a sharp edge, and be constructed correctly. There are too many "katana like objects" being sold out there. 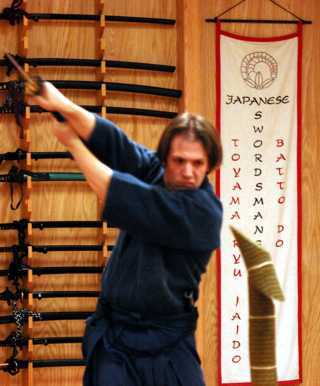 Iaito are used for practicing basic cuts and kata (forms). They are not made for banging together or cutting anything. Most have unsharpened steel or aluminum alloy blades. They should all have a ha (groove) on both sided of the blade. This is not a "blood groove". The pitch and position of the sound made by this groove moving through the air allows you to determine if the sword is being swung correctly. Iaito take allot of abuse even if they do not impact anything. Most students swing their iaito about 200 times per class or about 20,000 times a year. In five years that is 100,000 times. There is also the occasional mistake that does involve hitting something. That is something the average wall hanger just can't do. Iaito Page. Shinken are real katana made for tameshigiri or cutting practice. There are allot of terms being used for these types of swords and not everyone calls them shinken. We normally cut tatami and sometimes cut bamboo in our Toyama Ryu classes. Most students average about 1000 cuts per year and a sword is expected to last for many years. A good shinken should not need sharpening more often than twice a year. We recommend shinken that are NOT stainless steel, are differentially hardened, have removable tsuka (handles) for inspection, and have proper fittings. Shinken Page. Do you want a real sword or something decorative? Do you want a katana or a "katana like object" to hang on the wall? Most people will be satisfied with the wall hanger without every understanding they don't have a real sword. If you are reading this - you are taking the time to educate yourself and those wall hangers will probably never look the same again. We carry swords that can stand up to real life. The making of swords is highly regulated in Japan. A katana made in Japan is often referred to as a nihonto. A smith can only make a limited number of swords per month using strict traditional methods. This controls the quality of swords but forces the starting price to around $7000. We sell Japanese Iaito practice swords. These are not considered real swords by the Japanese government and are not regulated. The real swords we sell are made hand forged in china. These are hand forged production swords using labor saving techniques. They are still made using some traditional methods such as differential tempering but are much more affordable than nihonto. Many iaito and decorative swords have a hamon or temper line artificially added. They use a purely cosmetic surface treatment that makes the katana look like it was differential hardening. These only make the katana look more authentic (well not really if you know what you are looking at). A differentially hardened katana (as opposed case hardened or tempered) has a hardened edge and a soft spine. The edge is hardened so it will retain a razor sharp edge while the spine is left softer so it will bend and not break. This is usually done with a traditional clay coating tempering process. We believe that differential hardening is key to making a shinken katana that will be used for extensive tameshigiri (test cutting). Our expectation is that a shinken should survive at least 10,000 tatami omote cuts (10 years of heavy use) and only need minor sharpening after every 500 (six months of heavy use). We have tried case hardened katana - they did not retain an edge well and we do not recommend them. How important is folding the blade? Don't confuse forged with folded because they are not the same. The folding process used for nihonto (traditionally made Japanese katana) is part of the refinement process for the steel. It produces a subtle hada (grain) in the surface of the blade. If you want a blade that has those characteristics - you want a folded blade. Many production shinken are not folded. They are made from a single monolithic piece of steel. We have not found any correlation between folded vs. mono swords and cutting ability, durability, or edge retention. The steel used and the tempering process are much more important for the functionality of the sword. Folded blades are much closer to traditional nihonto and that is worth the price for many people. The downside of folded blades is the possibility of weld failures between layers. Unless done correctly - the folded blade may be much less durable that a mono-steel equivalent. Everyone seems to want to know how many times the blade is folded. Some manufacturers make the number of folds a big selling point. You get 1024 layers if you fold the blade 10 times. You get 4096 layers if you fold the blade twice more. You get a million layers if you fold it 20 times. It does not improve the sword. If we are taking a traditional look at nihonto (traditionally made Japanese katana) - the answer is one. The big question should be - is two or three poor mekugi pins better than one proper one. We suggest the replacement of mekugi pins on most production shinken (including the ones we sell). Most are made of bamboo that is too soft. We also recommend reshaping the mekugi-ana (mekugi hole in the tsuka (handle) and nakago (tang)) to form a proper wedge shape. We have a DIY article on replacing mekugi (click here). If a sword is riveted, glued, or screwed together - it is not a katana. It is true we offer the same products as other on-line dealers. We recommend you come to the dojo store that you can come touch and feel the sword before you buy. Every sword is different and it is best that you choose the one right for you. We know Japanese swords because we train and compete in Toyama Ryu Battodo. We have years of first hand experience in what makes a good and bad sword. We have disassembled just about every production katana out there as part of the sharpening service we have offered for the last 11 years. If a sword does not pass our inspection - it goes back to the distributor. If your sword arrives from us with any problems - we will replace it. We also offer sharpening and repair services to keep your katana in top condition. We don't sell swords to make money. We sell swords because we love swords.